Schools and districts across North America count on us to deliver websites that are fast, secure and accessible. Power your website with our feature-rich content management system (CMS). The easy-to-use CMS makes editing your website as simple as writing an email. Show off your school’s unique character! 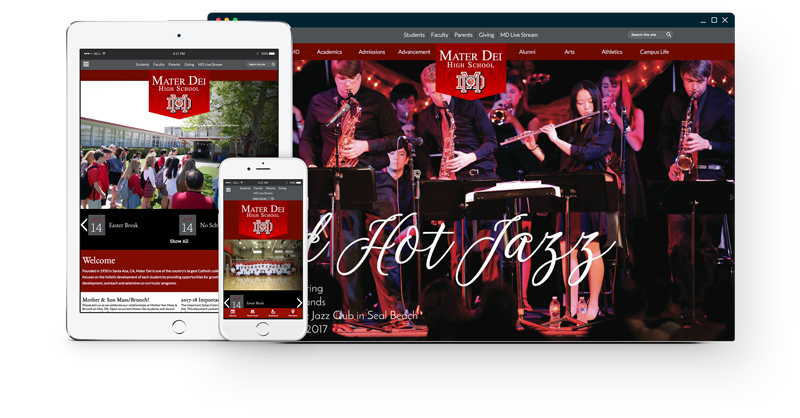 Your responsive website is designed with schools’ needs in mind and looks great on screens of all sizes. Work with a designer to craft a custom website, or pick a unique design from our preexisting gallery. Whether you’re looking to boost enrollment or improve parent-teacher relationships, we’ll work with you to achieve your objectives, from design, to development, to launch and beyond. We’ve got this down to a science! Our client services team has successfully launched thousands of sites across North America. We even help migrate existing content and train your staff to smooth the transition into your new solution. Take advantage of ongoing training and client services online, by phone, or from our Help Center. Our Client Success Specialists also host monthly live webinars to make sure you’re getting the most out of your website. Edlio’s cloud-based hosting includes 24/7 monitoring for stability and security, and all Edlio websites come with HTTPS encryption, so visitors will know that their information is safe.